Lately, my windowsills have been quite the popular hangout. Aside from my kids, here are a few of the animals hanging out on my windowsill. I got a new rooster. 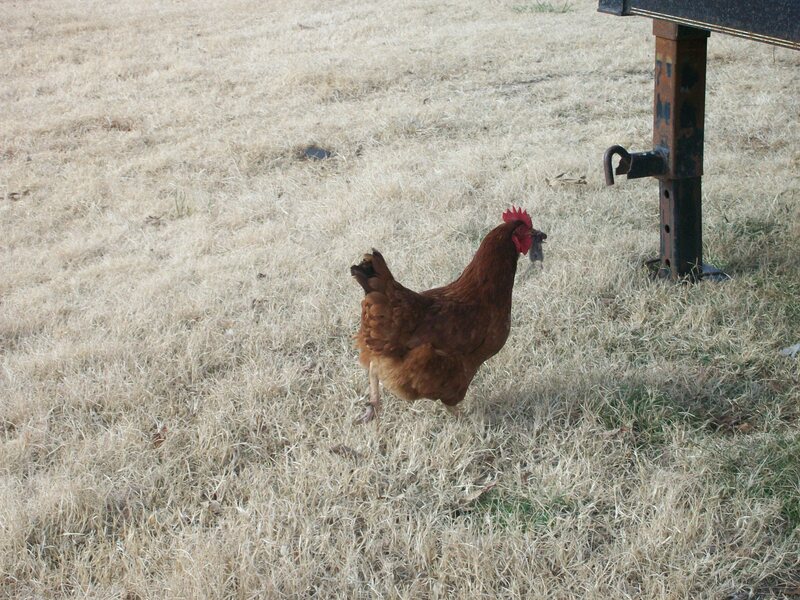 He was given to my Papa’s friend, Ken, who before Fred The Rooster arrived, had exactly no chickens. Apparently, Ken was driving down the road with one hand on the wheel and the other around the rooster when he met my Papa coming in the opposite direction. “Ken, what on earth are you doing driving around with a rooster?” Papa asked. “Do you need one?” Ken countered. “Well, I bet my granddaughter could use one,” Papa volunteered. So now I have a rooster. 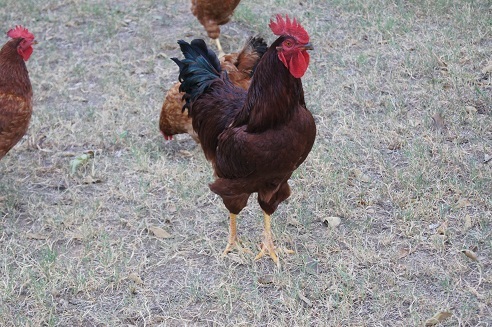 The rooster still doesn’t realize we have a chicken coop. Fred immediately took a liking to the feathered females running loose in my yard. 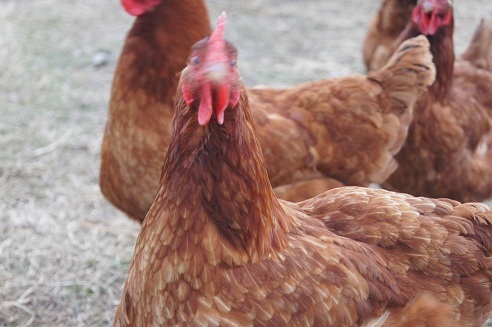 In fact, he’s been so preoccupied with them that he hasn’t even noticed we have a chicken coop on the premises. 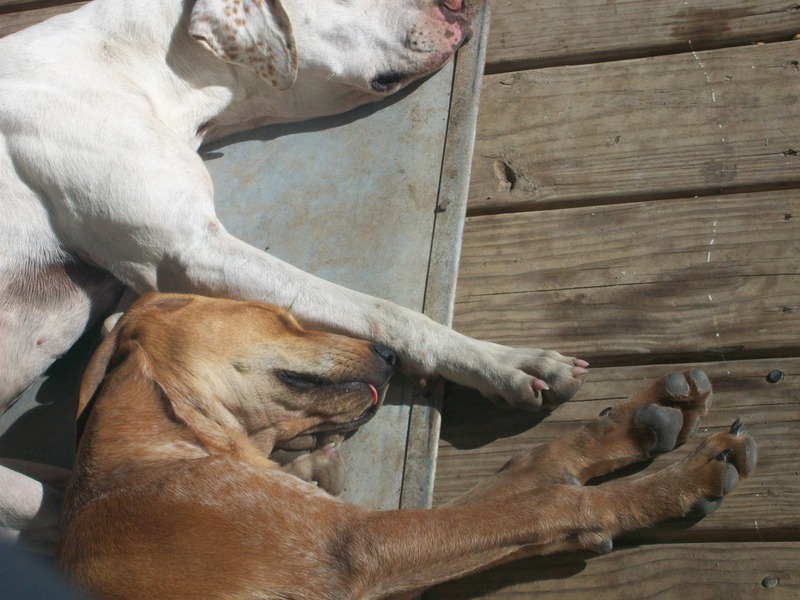 And being so tired by days end, he has since made himself at home on the front porch. 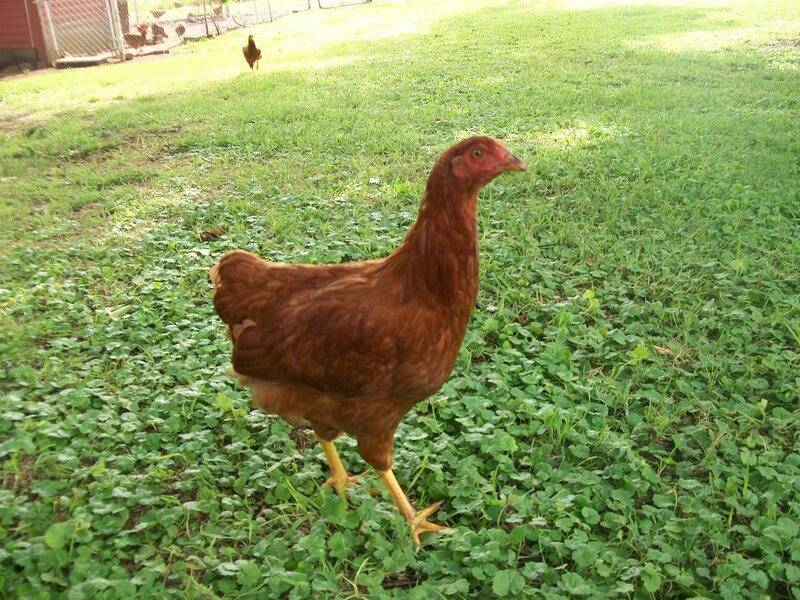 Along with all 7 of my hens. 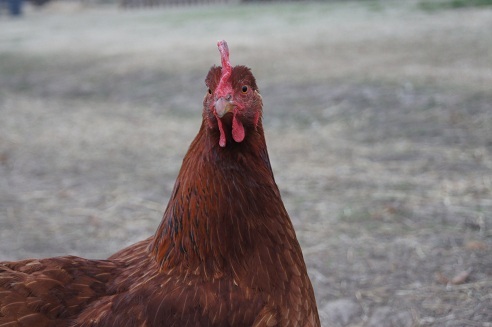 If you’ve ever owned chickens for any amount of time, you know that having them on your porch for even a minute is catastrophic. 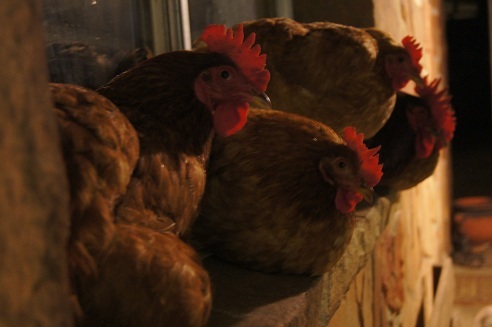 But when they go and roost on your porch for 10 hours, you may as well find another exit. So every night we move him and all 7 hens to the chicken coop. Fred is so tired he doesn’t even realize he’s been relocated to his appropriate sleeping quarters. All he knows by morning is that he’s got a lot of work to do. One of my antique windows in the kitchen is somehow missing it’s screen. I’m not sure how this has happened, but I think it means I need a new RED window to replace it. Regardless, because of the missing screen, it is always adorned with kitten drool. The drool, of course, dries and leaves the window with a rather dirty appearance. Partly because it is dirty, but mostly because the kittens are relentless in their efforts. 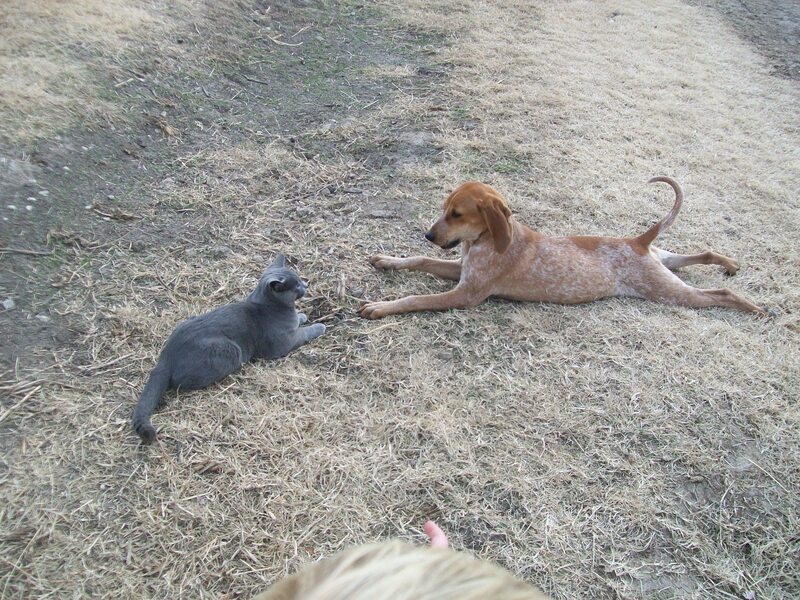 And just between you, me and the fence post… I was the instigator of the kitten drool. One morning, while clearing the table after a full breakfast of fried eggs, sausage and biscuits, I noticed one of the kittens sleeping peacefully on the windowsill. So before heading out to give the dogs their morning treats, I woke the adorable sleeping kitten to offer a few scraps. It really wasn’t much, just a little nibble of leftover egg. And I have regretted it ever since and will probably continue to regret it ’till my dyin’ day. From now on I will always let sleeping cats lie. 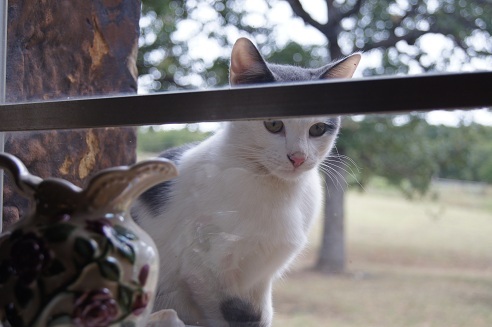 That little stinker told his brother, then his brother told his mother, and now every time I look out any given window in my house, there is a kitten with it’s wet nose pressed up against the glass begging me for food. Now all of my windows have kitten slobber on them. And I can’t even blame my kids for it. Every evening, there is a tree frog on my dining room window sill. And every evening, we watch him for a bit and try to see if we can catch his tongue in action. We assume it is a male since he is alone. We reason that females are probably not alone. I’m not sure why we reason this. There is no scientific evidence to support this hypothesis. It just is. 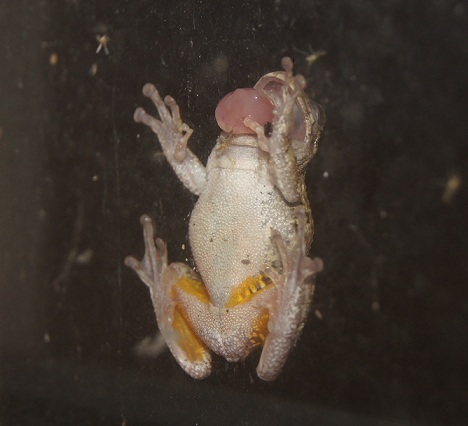 Earlier this week, our suspicions were confirmed when we noticed two tree frogs dining on the bugs outside our dining room window. The male frog had obviously brought a date. Apparently, though, it didn’t work out. We haven’t seen the female since. Shell color aside, I can always tell a free-range egg from a battery cage egg simply by cracking it open and looking at the yolk. 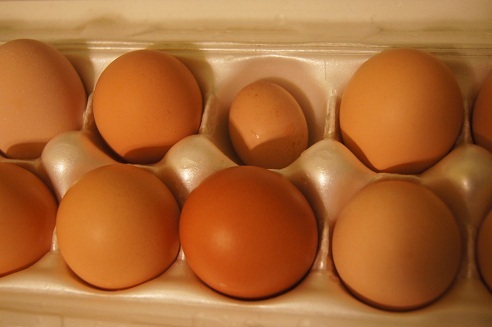 Can you figure out which eggs are free-range and which are battery-cage? 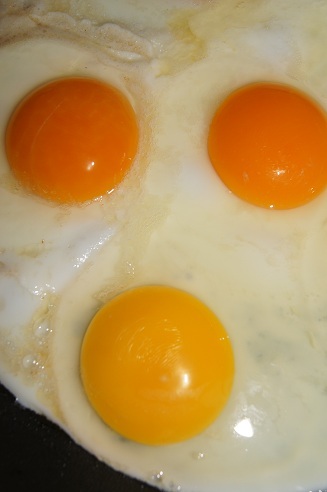 The battery cage hens only receive grain and are never allowed to access outdoor pasture, thus producing a pale yellow yolk. And I love that in a round about way, we are eating everything that we buy. Including the crumbs at the bottom of the Ruffles bag and the generic Cookie Crisp cereal that was reject by my children. 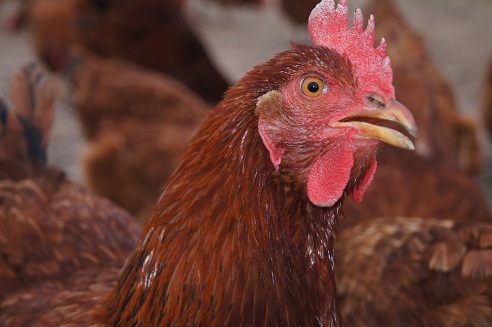 And FYI: Free-range eggs have been proven to have significantly less cholesterol, less fat, more vitamin A, more vitamin E, more vitamin B12, more omega-3 fatty acids (the good fat) and more beta carotene. Google it, you’ll be surprised at the difference. We had a pretty good turnout for our auction considering it was on a holiday weekend. I fed well over 100 people and rehydrated countless others. 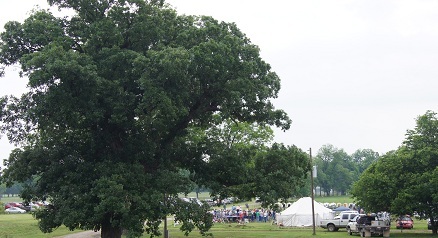 The concession was set up under our large white tent alongside the registration booth. If you ever find yourself in a situation where you need to feed an unknown number of people throughout the course of a day, I highly recommend preparing a couple of briskets beforehand, shredding it and placing it in a large electric roaster oven set on warm with a side of Sweet Baby Ray’s squeezable BBQ sauce and a few sliced onions. 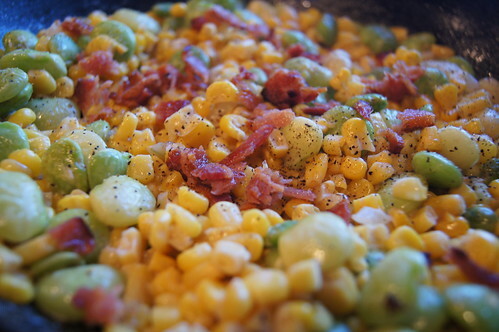 Super easy and super delicious. We also served up some grilled hot dogs for variety as well as some coffee and donuts for breakfast. Knowing how many donuts my own donut-deprived children could consume in one sitting, I over estimated the donut count and ended up with a couple or three dozen too many donuts on this particular morning. And ended up paying people to take donuts off of my hands. As well as sharing a few with my chickens. Who have never had donuts. And likely never will again. 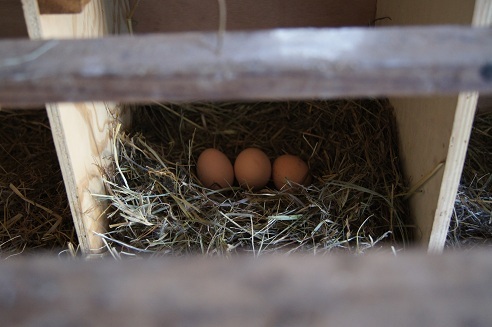 Today I was in the dairy barn looking for the feed scoop when I happened upon an undiscovered nest of eggs in a feed bin. 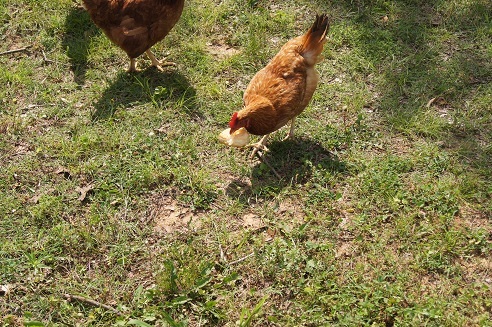 One of the many problems with letting my chickens have free range of the entire farm. It’s not that they don’t have plenty of nest boxes. I think they are just being lazy. 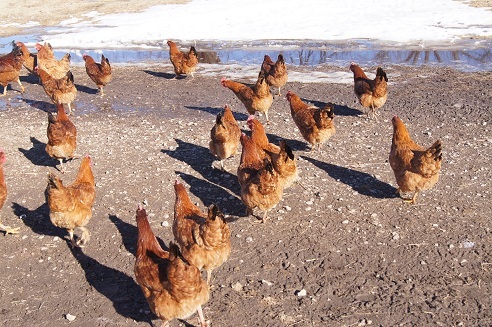 They go to the dairy barn for bits of corn and don’t want to walk all the way back to the chicken house to lay, so they just run around willy-nilly laying eggs wherever they fancy. Which wouldn’t be a problem if they would tell me. 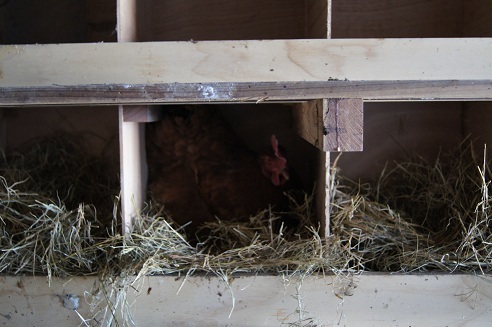 Most of the hens comply and lay in the nest boxes I’ve provided, but there are still a few rebels who refuse to cooperate. 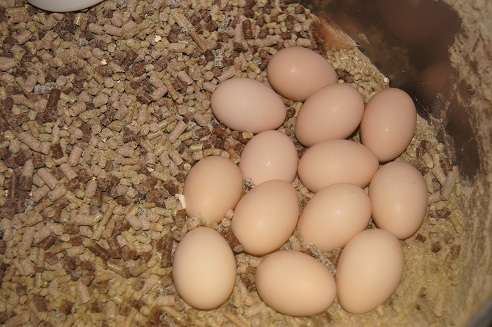 who’s laying the puny eggs? When the 2011 blizzard hit my small Oklahoma town, it wiped out the entire egg section at Wal-Mart for nearly two weeks. When they finally got the egg back in the store, the entire town was so excited that they threw a huge celebration in honor of it’s arrival. It’s was quite the spectacle. 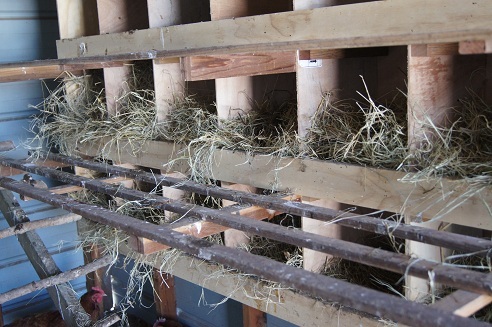 Meanwhile, back at the farm, the chickens were cooped up in their warm, comfy coop, with nothing better to do than lay eggs. And poop. See that funny looking ladder type thing made from tree branches? That’s my homemade roost. Not bad, huh? 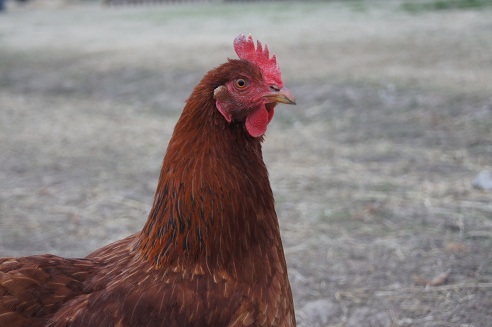 Where there is a roost, there is poo. 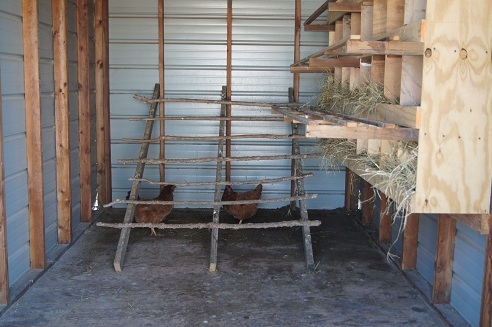 With so many chickens in such a small space for so many days, it’s inevitable… the chicken house was a downright mess. My house didn’t look much better. 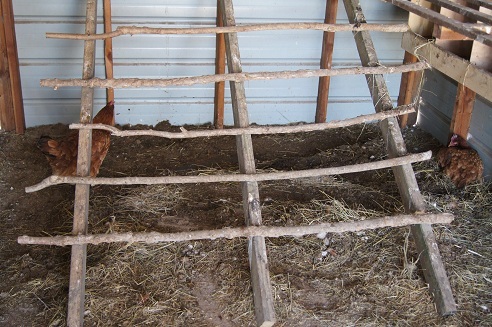 In fact, I think the chicken house was cleaner. Rather than clean them both, I decided that I would just move. So I packed up my things, hopped in the truck and motored out to the ranch house to check on the progress of the remodel only to find that the county road was no longer a dirt road. It was a mud pit… I mean road. And the house? Well, it still didn’t have any appliances. Or cabinets. Or sinks. Or lights. So I resigned to clean both my house and the chicken’s house. I think the hens are grateful. 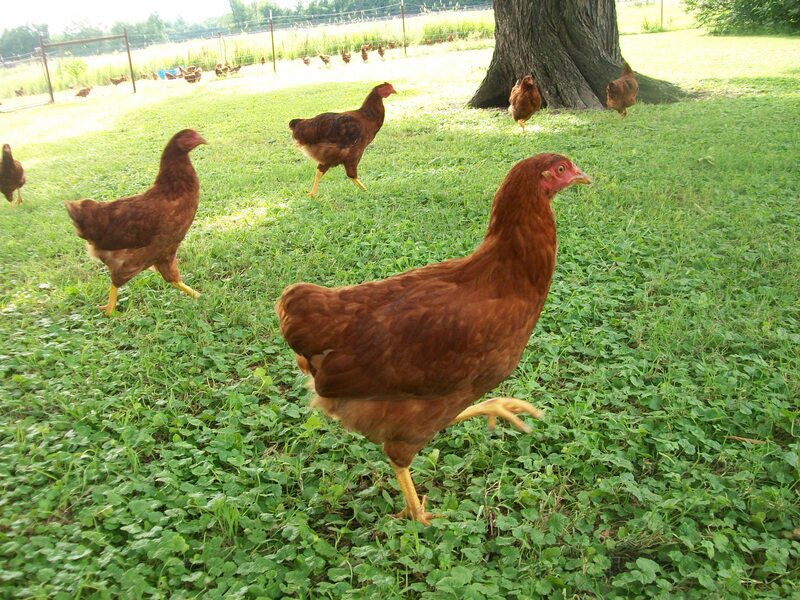 I love how enthusiastic my chickens are about each day. 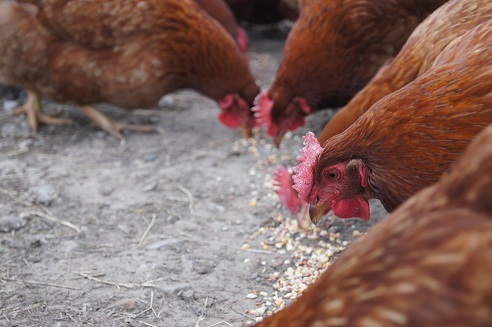 Every day they come bolting out the chicken house door and race to their favorite feeding spots. 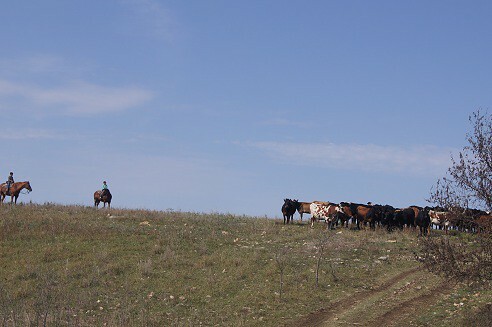 Some head to the pasture to pick the corn from the cow patties, some head to the lot to dig for bugs, others go to the pig pen and the dairy barn for leftover grain while a few stick around to see what tasty morsels I’ll have to throw out near the chicken house. Last night I made an apple crisp. I saved all the skins and cores to feed to the hens. I love having an animal to feed discarded scraps, it makes me feel thrifty. And when I forget about that cornbread I made for dinner a few nights ago, I don’t feel so bad, because I know it will not be a complete waste when I feed it to the chickens! 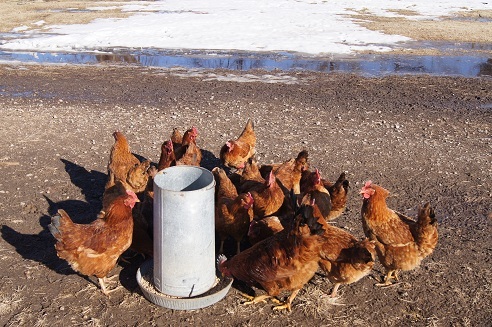 And during the winter, when there are no tasty bugs to chase and the worms have went deep into the soil, the chickens will eat almost anything. Including… mice? On a farm, everyone has a purpose. The farmer is the CEO and the janitor and everything in between all at once. The dog is head of security, keeping the coyotes at bay. The cows, pigs and chickens are in the production division. The horse is in charge of transportation. And the cats are in charge of pest control. And while the cats do a good job keeping the pest population in check, we still like to keep a few mouse traps out just to be sure we keep the pest population under control at all times. On this particular day, we caught a mouse in a trap and threw it out for the cats to inspect. 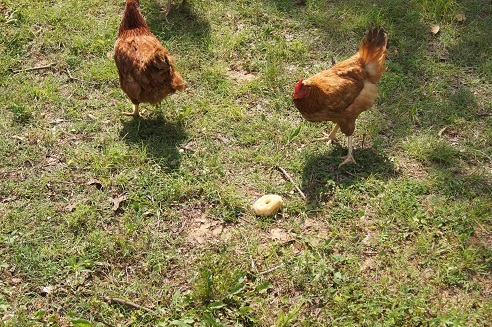 Only, this time a hen ran by and snatched it up! 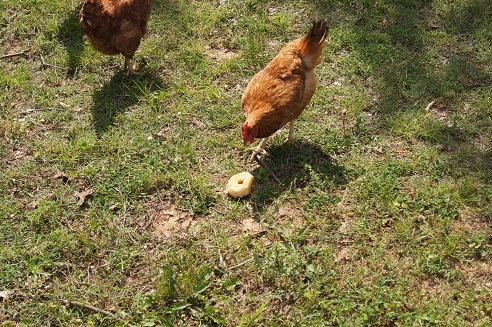 I didn’t see whether the hen ate it or not, but it was gone. And that’s all that matters. Job well done. Now get back to work!